Just about everyday I catch Angela adding another reader recommended campground or location to our Google Map. The bulk of these reader recommended locations come in through submitted Truck Camper Magazine calendar entries, lifestyle interviews, our destination series, and Questions of the Week. A few more recommendations trickle in directly via email as readers tip us off on a favorite spot, or invite us to camp in their driveway. Yeah, we do house calls. All of this would be academic if we didn’t actually follow up and visit these reader recommended locations while truck camping. Truth be told, we use our Google Map all the time to see if there’s a reader recommended spot near by. It’s like having road magic in a bottle, ready to go where ever we go. If you don’t already have a Google Map for truck camping, I implore you to check out Angela’s cleverly titled how-to article, “Essential Google Maps For Truck Camping”. It’s not at all unusual for us to open our Google Map and plot where we’re going based on Truck Camper Magazine reader recommendations. The annual calendar contest alone is responsible for about a third of our truck camping adventure destinations. Seriously, our truck camping life would be a lot less fun and interesting without the incredible places you have shared with us. Thank you! We have it on good word that we’re not the only one using this magazine to find destination ideas. The most obvious example would be our bucket list destination series including Death Valley, San Juan Skyway, Canadian Rockies, Glacier National Park, and Alabama Hills – just to name a few. Or perhaps you saw a calendar entry and said, “I am going there!” Maybe you read a lifestyle story and said, “I want to go where they went!” Somehow there’s nothing more inspiring than seeing a fellow truck camper in an amazing place. If you look at it the right way, Truck Camper Magazine is practically a shopping guide on where to go in a truck camper rig and what to do there. Just open the Gallery and surf through hundreds of calendar photos, or click on Features and dive into the Lifestyle Stories, Off-Road Adventures, Beach Camping, Alaska, Canada, United States, or World Travel. If some of those stories don’t get your truck camping blood pumping, you might be dead. 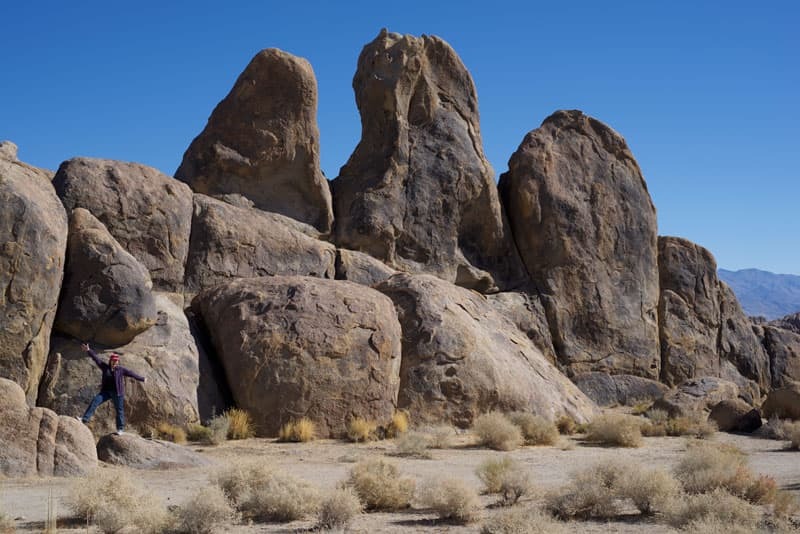 Our most recent example is Alabama Hills in Lone Pine, California. After numerous calendar entries and winners, and a tantalizing destination article, we finally visited this incredible destination for a full two weeks. Above: Find Angela in the photograph above. Forget Waldo! Where’s Angela? 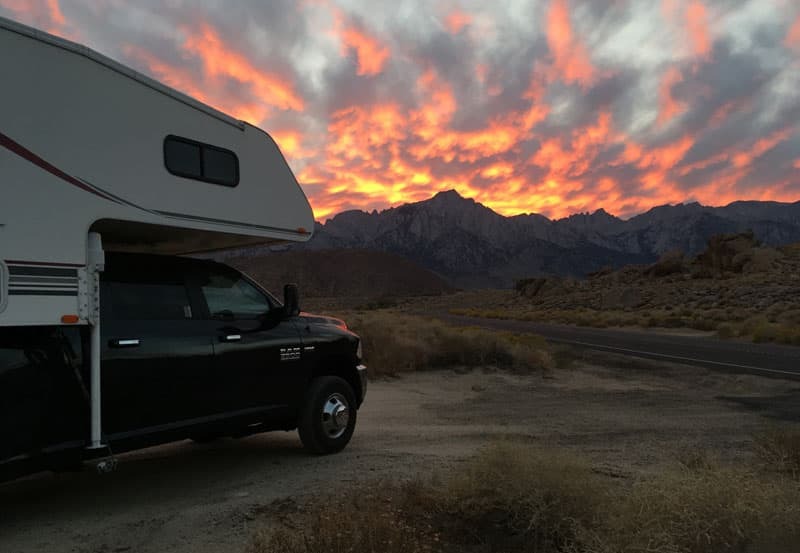 Alabama Hills is a must-see destination for every truck camper owner. In our opinion, it’s at least as interesting as many national parks, and it’s free to camp there. Above: That’s me on the right enjoying a chilly morning and plotting my next photograph. 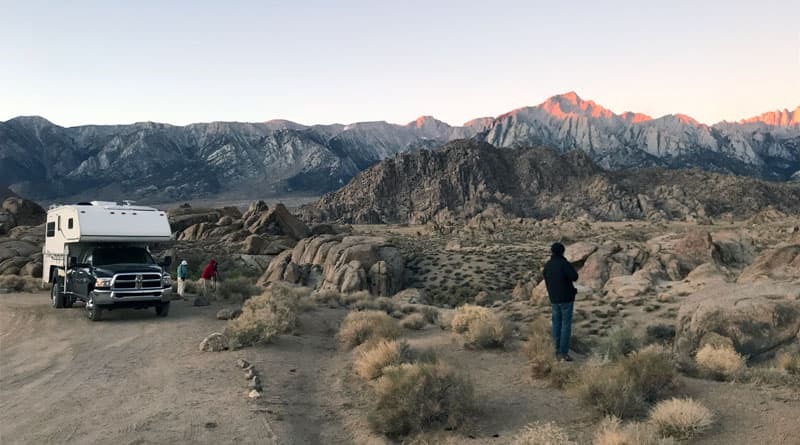 Alabama Hills is an absolute must for photographers. We are definitely going back. Click here to read about destinations readers have visited. Home » Truck Camper Magazine Blog » Where Did These Electrons Send You?